This morning Karen and I hiked the Saddleback Horse (Yellow) Trail, the seven-mile loop around the base of Sugarloaf Mountain. The trail begins and ends at the farmhouse, near the entrance to the park. We pulled into the already-packed parking lot at around 9 a.m. and were lucky to find someone pulling out. It’s not nearly so difficult to find a parking spot inside the park, further up the mountain, in the lot at the head of the more popular Northern Peaks (Blue) Trail. The Yellow Trail would, perhaps, be as popular if the parking for it was more adequate. As it is, the Yellow Trail is serenely quiet, except for the singing of birds. During the three hours that we were on it, Karen and I met about half a dozen other hikers and crossed paths with one whitetail deer. The trail is well marked, both with yellow blazes and with mileposts. The mileposts are marked 1 to 14, each signifying about half a mile. The trail begins and ends on pavement, but in between it is a dirt path, easy to moderate in difficulty, for the most part well worn. It crosses water at several places, but the creeks are narrow and shallow and well-placed rocks make them easy to traverse. The trail was often rather muddy; this is probably half due to the nearness of the creeks and half due to the rain that fell yesterday. Of course, at the end of the day, one can rinse off one’s boots. 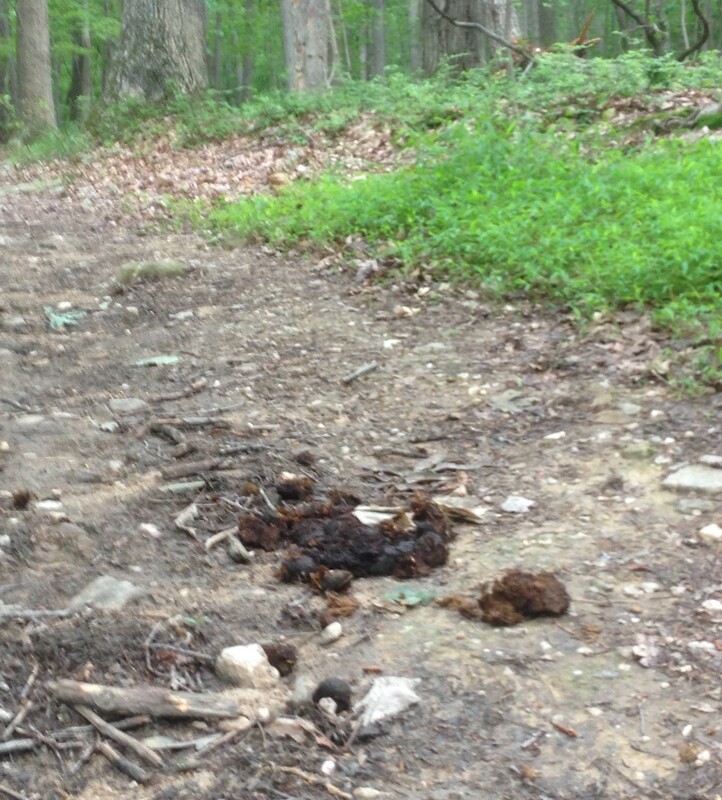 Oh, and did I mention that this is a horse trail? Well, as said, one can rinse off one’s boots. 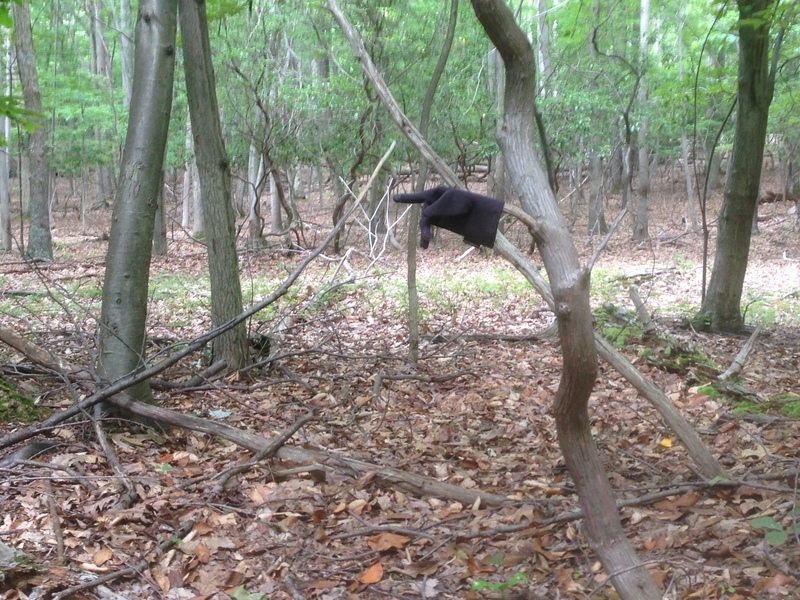 As Karen and I approached the end of our journey, we came across a phantom hand showing us the direction of our path. We appreciate the help. 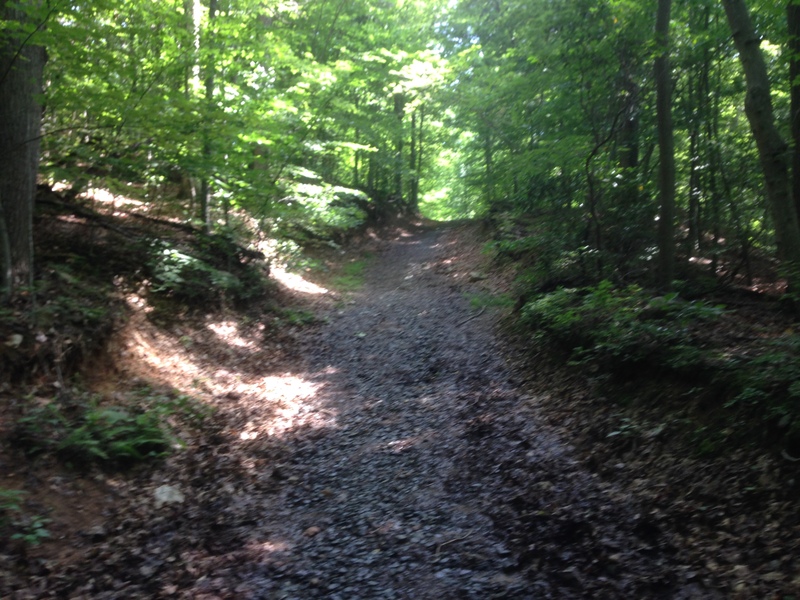 This entry was posted in Birch's Jots on Jaunts and tagged Day Hike, Sugarloaf by Birch. Bookmark the permalink.